When the Upstairs Gallery was voted Best Underground Art Space in this year's Best of Chicago readers' poll, the folks who run the space at 5219 N. Clark took that as a sign to go out on top. At the end of the month the performance collective's physical space will close down. "It feels like in the last year something changed," says cofounder Alex Honnet. "It stopped being 'I can't believe I'm doing this' and became 'I'm doing this again.'" 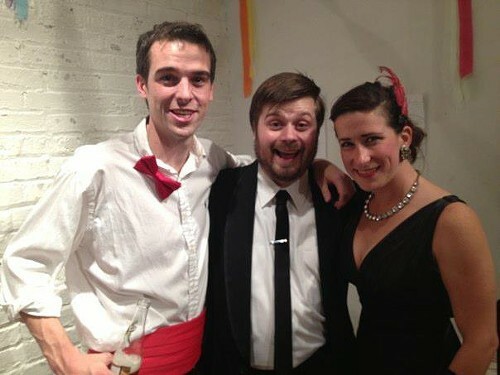 Honnet, along with Caitlin Stephan and Walt Delaney, started the Upstairs Gallery in the fall of 2010 as improv students looking for a place to perform. What started as a monthly showcase soon turned into weekly shows, and before they knew it they were running the space. For three people who never intended to run a theater, they really stepped it up when they were suddenly operating as a full functioning performance space almost every night of the week. In the past month they decided the best path for all of them was to leave the physical space behind and concentrate on their own creative endeavors. Delaney will focus on acting in and writing films (his current project, Small Americans, is almost complete) while Honnet and Stephan have plans to continue producing shows around the city. The Upstairs Gallery's longest running improv show, Sick Adventure, as well as its collaboration with the comedy blog Steamroller, Goofballs United, will continue their monthly runs at different locations around the city. As for the Upstairs Gallery house improv and sketch teams, they're currently on the lookout for a permanent home. Starting on September 16, a series of shows will run every Tuesday at the Annoyance Theatre under the Upstairs Gallery name, keeping true to their mission of providing a chance for odd and experimental shows to get in front of an audience. The space is going out with a bang with performances at 8 and 10:30 PM every night of the week until the end of August, and a packed schedule from 6 PM until well past 1 AM during the weekend of August 21-23 for the second annual Jangleheart Circus. In a send-off on their Tumblr the founders wrote, "The last thing we want is to feel burned out or resentful towards the UG for not being what it was never supposed to be in the first place. We're leaving the space because we want these last three years to be a snapshot in time of the people we were and the work we did. The community that we built together and the memories we made will be everyone's to hold onto."